Kay is a primary producer with an interest in rural and environmental issues. She has extensive business management and corporate administration experience with specific focus on strategic planning, national competition policy, organisational governance, policy formulation and business and financial management and administration. She holds a Business degree with a major in Accounting, is a Certified Practising Accountant (CPA) and a Graduate of the Australian Institute of Company Directors (GAICD). A Certified seed grower living in Mt Gambier, South Australia, with having established his own business. Ben has a diverse experience in all aspects of AuSPICA’s operation. In the 1980’s, Ben was involved in development of a tissue culture lab and Minituber houses for NSW Agriculture. Ben worked for Technico Pty Ltd, as Technical Manager and a key player in commercialisation of Technico’s trade secret propagation technology, and package of agronomic protocols for mass plantings of TECHNITUBER® seed. Ben has strong experience in all aspects of seed potato production from tissue culture to certified seed. He has been involved in Potato variety improvement from replicated small plot trials, to bulk plantings. Charlie is a primary producer and a highly experienced corporate/commercial solicitor. Charlie practices across all areas of corporate, commercial and property law with a particular focus on clients that participate in the agribusiness and resources sector. Charlie’s legal and business experience coupled with his interest in agriculture brings a valuable skill set to AuSPICA’s board. With his family, Charlie operates a beef cattle enterprise in West Gippsland, Victoria. A Certified seed grower at Ballarat, Con has had significant experience in local government as a Shire President. Con continues to contribute to his local community as a justice of the peace. An industry leader as President of the Ballarat seed growers and former Chair of Seed Potatoes Victoria. David is an Agricultural Scientist who has extensive experience in arange of Agricultural crops. In particular, he brings to the Board his considerable experience and knowledge on potato production and French fryp rocessing with an international perspective. Dave also has valuable experience and knowledge of PCN management strategies and is involved in leadership roles in the potato industry. A Certified seed grower at Ballarat, Ken has had a long history with his involvement in on-farm research trials on new cultivars and disease management. Ken is an industry leader through his previous involvement in many committees including SPV, HAL Industry Advisory Committee and many others. For the past 11 years Liz has worked as the Industry Development Manager for the Australian Processing Tomato Research Council. During this time, as the sole employee of the industry Liz has been responsible for overseeing the industries R & D program along with managing the research account, and representing the industry at HAL, PHA and some international industry meetings. Liz has also managed a number of separate programs for the industry through DAFF and more recently DSEWPaC, with the APTRC selected as a delivery partner for round 1 of the On-Farm Irrigation Efficiency Program. Liz is responsible for organising training and development for growers and more recently conducting the industry’s cultivar trials. Prior to her involvement in the Processing Tomato industry Liz worked with Botanical Resources Ltd, on the pyrethrum in Northern Tasmania. During this time Liz worked with growers along the North West Coast and also the North East of Tasmania providing agronomic advice on pyrethrum crop management. Tony has potato industry involvement that spans 35 years during which time he has witnessed many geographic and structural changes in the industry and includes roles as executive officer of Seed Potatoes Victoria and The McCain Growers Group. In these roles Tony was instrumental in encouraging these organisations to develop policies on key matters and to undertake risk analyses and risk mitigation strategies where appropriate. Mr Pitt has been involved in numerous international projects in Papua New Guinea, China and Indonesia. He jointly designed and established the seed potato scheme for Papua New Guinea during his stay. Mr Pitt is a trained group facilitator with a Masters of Agricultural Science from the University of Melbourne with post graduate studies in Banking Law. 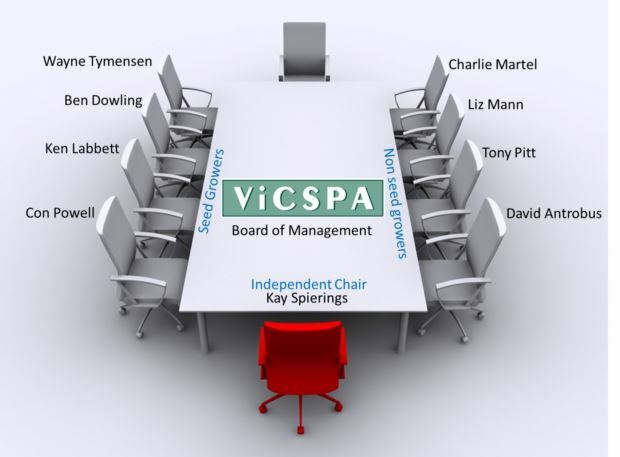 Tony brings considerable specialist technical knowledge in the disciplines of crop agronomy, soil science, irrigation, and environmental hazards of land management and farming systems to the Board of AuSPICA. A progressive crisping and certified seed Potato grower, Wayne is a second generation potato grower based at Cora Lynn in a district known as the Koo Wee Rup swamp. His business has vertically expanded to include a certified seed production business in the Otway’s. Wayne is an enthusiastic and passionate about the potato industry he has an excellent track record to provide sound practical advice and clearly communicate to all. Wayne is involved in several local community groups, including involvement in the local school board.